There are some art forms that seem unbelievable—photorealism, shadow illusions, fumage. Then, you’ve got sand animation, one of the only types of art that truly exists in the moment, since it cannot be preserved. Unless, of course, you capture it on video. And it’s about Game of Thrones. 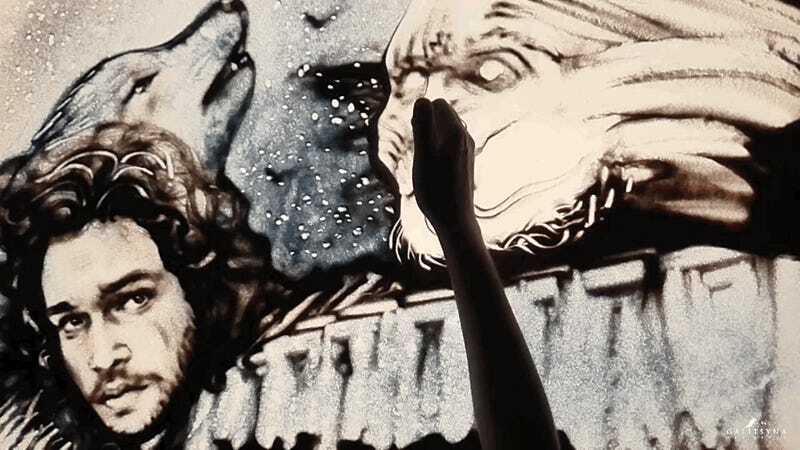 Sand animation artist Tetiana Galitsyna recently shared her latest creation on YouTube, using sand to depict some of Game of Thrones’ most famous characters and scenes from the upcoming season. It looks to be the first time the artist has made something about a popular television show (she normally creates artistic videos set to classical music), but it was worth the wait. It’s truly a sight to behold. It takes a hell of a lot to skill to create art using nothing but your hands and tiny mineral grains that can be blown away by a thought. Through her work, a lion becomes Cersei, a wolf turns into Jon Snow, a White Walker (formed from a Three-Eyed Raven) becomes the Mother of Dragons, bringing new meaning to “Ice and Fire.” The piece shifts and bends as she works, letting the art exist within the movement, rather than just in the final product. You can check out the video below. Game of Thrones returns July 16.